Vietnam’s Mekong Delta region is likely to feel like a long way from home, as the relentless drone of scooters and mopeds is replaced the relentless drone of boat engines and around every corner of the maze of waterways that substitute for a road network is another jam-packed scene straight out of a travel documentary – from fishermen and floating convenience stores jostling for space to the large market boats advertising their wares on long poles at the bow. It’s a place that gives each sense a workout – your eyes scrambling to capture every detail of these not-exactly-seaworthy craft; the aforementioned four-strokes pumping out noise and exhaust fumes and the relentless humidity quelled only by the gentle breeze as your boat chops across the water. But when it comes to your tastebuds things start to get even more experimental. 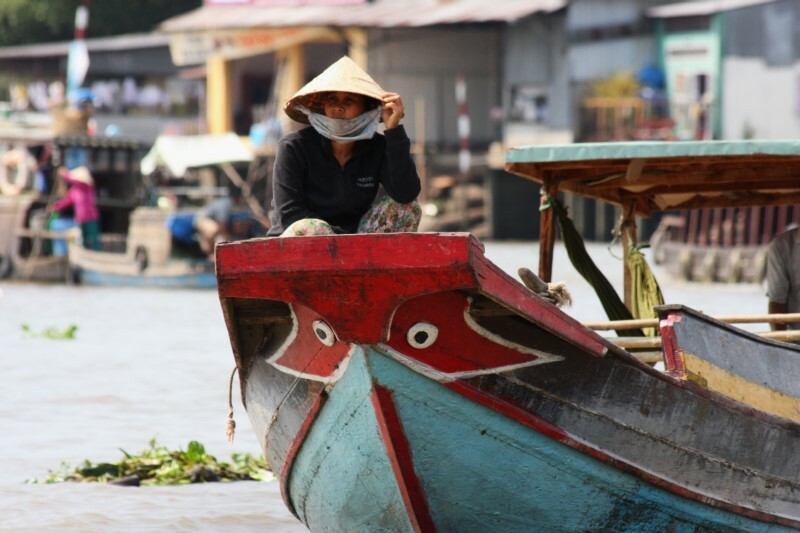 Getting to and around the area is not the most straightforward if you forgot to pack your canoe and outboard so there’s no real shame in tagging along with a group tour and, if you book it when you get to Vietnam it will be incredibly inexpensive. 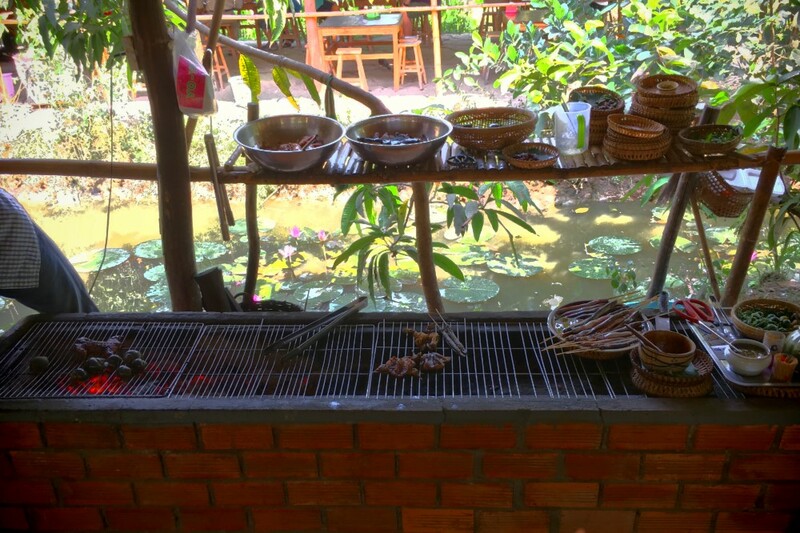 That’s exactly what we did, and a lunch stop on day 2 took us to Hien’s Homestay where it was a delight to see a nice big charcoal grill sizzling away. This guy was not, however, knocking up burgers and chicken wings. If you like to be a bit adventurous with your food you will understand the excitement at a menu that listed a local trio of snails, snake and rat. This guy was not knocking up burgers and chicken wings. Unable to choose, I opted for the mixed grill and watched as a couple handfuls of larger-than-life snails were added followed by, for want of a better term, a spatchcocked rat. But things got pretty real when the grill master fished around in a tank next to him and produced a still-live snake before whipping it against the grate’s brick support and tossing it on the grill. None of the dishes exactly required a low and slow approach, so a few minutes later everything was chopped up into bitesize pieces and served up in leafy baskets with a side of fruit. As I always seem to find, the snail proved a challenge to access the goods – much to amusement of the local guides who were either trying to demonstrate the correct technique or simply mocking my own. Once the correct cocktail stick technique established the meat itself turned out to be surprisingly tender with a garlicky sauce keeping things relatively familiar. The rat also maintained a familiar sensation with a marinade that wouldn’t have been out of place on a rack of babybacks and a general experience not too dissimilar to picking through chicken wings. The snake continued to be a venture into the unknown and is probably a better talking point than a meal. The grill did some lovely work on the skin as you would see with grilled fish, but the main question was whether to eat the little snake nuggets whole or discard the questionable-looking inners. In the end, neither option seemed ideal, being either not quite the right kind of chewy or ultra fiddly, respectively. 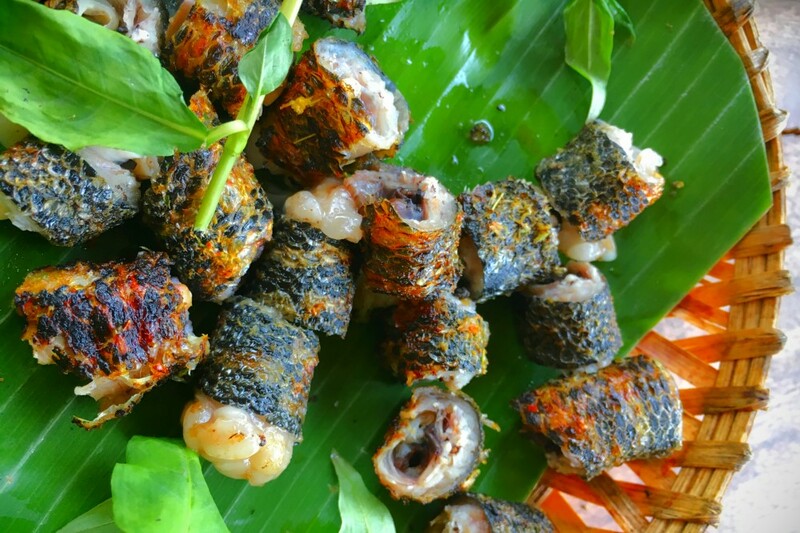 Given that it was slithering around with its mates just a few minutes earlier there was obviously no marinade or rub added which would have lifted the slightly bland natural flavour – but how many people have eaten grilled snake? It will certainly be an interesting one to try at home!